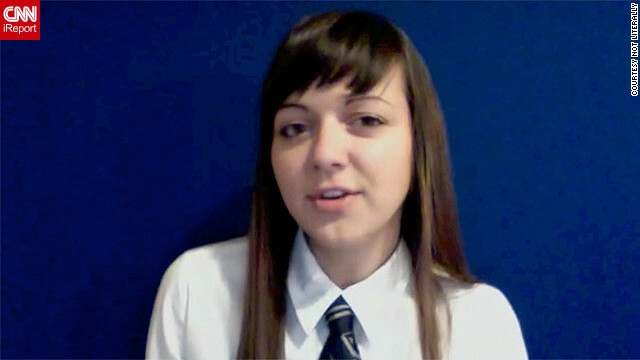 Ginny DiGuiseppi portrays a Hogwarts student responding to a viewer question. Dana Ritterbusch and Ginny DiGuiseppi aren't your ordinary "Harry Potter" fans. The two college students from Denver recently began a series of YouTube videos in which "Hogwarts students" respond to people's everyday questions. The videos, called "Ask Hogwarts," are parodies of the differences between the different Hogwarts houses in the "Harry Potter" books and movies. Tens of thousands clicked on the original video after it was posted earlier this month. CNN Geek Out: What inspired this video? Ritterbusch and DiGuiseppi (a.k.a. "Not Literally"): We've always been very big fans of both the "Harry Potter" books and movies, and since both of us are performers, we were inspired to combine the two. As our work gained popularity, we decided to branch out into comedy as well. We were inspired by other comedy videos that parodied Hogwarts house stereotypes, like "Which House Are You" by The Second City Network. We hadn't seen any Harry Potter-themed advice vlogs, so we decided to give it a try. CNN Geek Out: How long have you been doing videos like this? Not Literally: We formed "Not Literally" about seven months ago, soon after Ginny's "Ravenclaws" video went viral by freak coincidence. We started out just doing parody music videos but have recently decided to branch out into comedy. Not Literally: We've been totally shocked by the interest our videos have generated. The Potter fandom is incredibly passionate, which has led us to always push ourselves to put more effort into our work. The response has been overwhelmingly positive, and we have felt very welcomed by the fan community. CNN Geek Out: Are you all big fans of "Potter" going way back? Not Literally: Absolutely. We've both been strongly attached to the series since we were first introduced to it. We've followed and loved both the books and the movies and don't see that changing anytime soon. CNN Geek Out: How did you decide who would play which house of Hogwarts? Not Literally: We wanted Dana to play a Slytherin and Ginny to play a Ravenclaw, since those are our respective houses. As for the other two, we tried to pair up the roles so that each of us were playing houses most opposite each other in personality. Playing both Slytherin and Hufflepuff, for instance, is more varied and different than playing both Slytherin and Gryffindor, who can both be proud and strong-willed. CNN Geek Out: Future plans? Doing more just like this? Not Literally: We have plans for both more parody music videos and more comedy. "Ask Hogwarts" is the beginning of a series [you can watch episode two here], so we definitely plan on doing more of that. We're going to give advice to fans for this series, so send us your questions at not.literally.productions@gmail.com. "We R Slytherins" was the first in a quartet of house pride parodies, so we have three more of those to go. Next in line is Hufflepuff, which is in production right now. We also have a mess of other ideas, both musical and comedic, that we can't wait to develop further and try out! Please define "waste of time." Most hobbies are TECHNICALLY a waste of time. Do you like to watch professional sports on TV? What a waste of time! Do you like to go to movies? What a waste of time! Do you ever go out to dance clubs or bars? What a waste of time! In fact, do you do ANYTHING that doesn't directly lead to the acquisition of wealth, the creation of goods, or some other measurable result? Obviously, you're just wasting your time. Seriously, these kids are having FUN. It's their hobby, and other people are clearly enjoying the product of their hobby. How is that any different from people who produce other types of entertainment? The kids have a hobby, and they're sharing it with people. Not everything needs a measurable purpose. Very cute. Those two are funny, but I prefer the Ravenclaws Friday parody. Ginny is also a mega cutie. This is fantastic. So excited!